Discover your options for treating Liver tumors with CyberKnife. Cyberknife is the first and only Robotic Radiotherapy system for detecting and treating tumors in real time, maintaining sub-millimeter accuracy. This is particularly important for the treatment of liver tumors. Treatments are completed in 5 days or less. Most patients experience minimal to no side effects with a quick recovery time. If you’ve been told that doctors can’t remove your liver tumors with surgery, or you need radiation therapy as a follow-up to surgery, then CyberKnife liver cancer treatment for patients in Los Angeles might be a good treatment option for you. The name CyberKnife might sound like a surgical instrument, but it’s actually a non-invasive radiation treatment for liver cancer. Unlike other liver cancer treatment options, CyberKnife radiosurgery requires no anesthesia and no overnight hospital stay. Most patients experience few if any side effects, and they can go home right after their treatments. Best of all, Medicare and most private insurance companies cover CyberKnife treatment, which makes this treatment option more affordable. Your liver lies in the upper right quadrant of your abdominal cavity, resting against both your bowel and your lungs. Your bowel and your lungs are constantly in motion, which means that liver tumors are constantly moving. This movement makes it tough to treat liver cancer with conventional forms of radiation therapy. CyberKnife radiosurgery combines advanced, real-time image guidance, tumor-tracking software, and sophisticated robotics to treat liver lesions more comfortably and more effectively than standard radiation treatments. Instead of relying on older, uploaded images that might not reflect what the cancer looks like now, CyberKnife takes an image of your tumor every time it emits a radiation beam. Even as you’re breathing, and your bowel is working normally, CyberKnife can adjust and target cancer lesions with pinpoint accuracy. CyberKnife’s robotic system accounts for even the slightest movement, correcting the direction of the radiation beam. This capability allows CyberKnife to deliver high-dosage radiation safely and accurately without damaging healthy tissue around the cancer cells. You also won’t have to be placed inside painful compression devices designed to keep your body still. In addition, you won’t have to hold your breath repeatedly during treatment, and you can also skip complex gating techniques that use CT scans to match the radiation delivery to your breathing patterns. CyberKnife’s flexibility means precise radiation dosages, down to the sub-millimeter. The radiation targets your liver tumors with minimal risk to healthy tissues. Is CyberKnife Liver Cancer Treatment Right for You? Inoperable tumors: Your tumor is complex. Sometimes, cancer cells form complex tumors that just aren’t treatable with traditional surgery. CyberKnife, as part of your oncologist’s treatment plan, provides a way to attack complex, inoperable tumors. You need radiation therapy in addition to surgery. CyberKnife treatment provides a quick course of radiation therapy to catch any cancer cells that surgery might have missed. You have liver lesions because another type of cancer has spread. If colon, pancreatic, or other types of cancer have spread to your liver, CyberKnife can be an effective, safe, and convenient liver cancer treatment in Los Angeles to use along with other therapies. Your liver tumor has come back. If you’ve treated liver tumors before, but the cancer has come back, CyberKnife can precisely target and destroy the cancer cells that other treatments have missed. You’re not in the best of health. Traditional cancer treatment and the effects of liver cancer can take a toll on your body. Non-invasive CyberKnife treatments have minimal side effects, require no painful compression devices or breath holds, and provide a gentler, more comfortable treatment alternative. Refusing surgery: You don’t want to have traditional surgery. If you prefer not to have surgery to treat your liver cancer, CyberKnife can provide an effective and safe alternative treatment for Los Angeles patients. The CyberKnife System uses advanced robotics and sophisticated software to treat tumors in motion with high doses of pinpoint radiation, accurate down to the sub-millimeter, delivered directly to liver tumors. The U.S. Food and Drug Administration cleared the Cyber Knife in 2001 to treat tumors anywhere in the body, including the liver. The CyberKnife System is not a surgical procedure. In fact, it involves no cutting or anesthesia. Extremely accurate radiation directly to the tumor. Minimized side effects and no pain. One to five treatments completed in a comfortable outpatient setting. No anesthesia, no hospital stay. Instead of traveling to a cancer center for six to eight week of standard or conventional radiation therapy, with CyberKnife you have one to five short treatment sessions, usually less than an hour each. The non-invasive and extremely precise radiosurgery minimizes your chances of experiencing complications, and you can go home right after your treatment. Many patients even return to normal daily activities, but some patients do experience some fatigue following treatment. Based on CT scans, our medical physicists and radiation oncologist develop the ideal treatment target and radiation dosage. However, while other devices are forced to rely on static CT scans, our doctors only them as a starting point for developing treatment. CyberKnife’s advanced real-time imaging and tumor-tracking software make rapid adjustments throughout the treatment process, ensuring that you get highly targeted radiation dosages delivered exactly where they’re needed. While receiving your treatment, you’ll lie comfortably on a treatment couch while the CyberKnife robotic system silently moves around you. Liver tumor treatment sessions typically last between 25 and 55 minutes. The non-invasive treatment is pain free and most patients listen to music during the procedure. Most patients experience no side effects at all. Others experience some pain in the liver area, nausea, and fatigue, but these usually go away within the first week or two following your liver cancer treatment. Instead of going through several weeks of standard radiation treatments, you’ll only have between one and five treatments, delivered once daily. Pasadena CyberKnife performs liver tumor treatment in Los Angeles on an outpatient basis. Most of our patients have no problem returning to normal daily activity — even on their treatment days. We’ve treated many patients who have many different types of cancer and we recognize that each patient’s case is unique. If you’ve been diagnosed with cancer or lesions of the liver, contact our liver cancer treatment center in Los Angeles by calling 626-768-1021. One of our board-certified oncologists can determine whether CyberKnife treatment is the right decision for you. We look forward to meeting you and learning more about how we can help you. To get started, call or fill out our Web form today. The CyberKnife® Robotic Radiosurgery System was cleared by the U.S. Food and Drug Administration in 2001 to treat tumors anywhere in the body, including the liver. Despite its name, the CyberKnife System is not a surgical procedure. In fact, there is no cutting or anesthesia involved. Instead, the CyberKnife System uses advanced robotics and sophisticated software to treat tumors in motion with high doses of pin-point, sub-millimeter accurate radiation directly to liver tumors. The CyberKnife System offers patients a non-invasive alternative to those who cannot undergo liver cancer surgery due to their poor medical condition, or who refuse surgery, an alternative treatment for liver cancers. Pasadena CyberKnife liver tumor treatments are performed on an outpatient basis in one to five days, requiring no overnight hospital stays. Most patients experience minimal to no side effects with a quick recovery time and can return to normal daily activity even on their treatment days. How Does The CyberKnife System Treat Liver Tumors? How does Cyberknife Treat Liver Cancers? Treating liver cancer with radiation therapy is a challenge because liver tumors move with respiration. In addition the tissue surrounding the liver tumors is very sensitive and can be damaged easily. The CyberKnife Radiosurgery System is able to deliver very high doses of radiation to both primary and metastatic liver tumors with extreme accuracy. Working in conjunction with the CyberKnife System is the Synchrony® Respiratory Tracking System, which enables the radiation beam to track tumor movement in real time and allows patients to breathe normally during their treatment sessions. With the CyberKnife System, doctors can zero in on a moving target – the liver tumor – and irradiate it without harming the healthy surrounding tissue. As a result, the CyberKnife treatment is more comfortable for patients, radiation is delivered more accurately and treatments can be completed in one to five sessions. Once the team is in place, the patient will begin preparation for CyberKnife treatment. During the first step, the patient is scheduled for a short outpatient procedure in which three to six fiducials – tiny gold seeds each about the size of a grain of rice – are inserted into and around the liver tumor using CT guidance, ultrasound or via a camera that is passed through the mouth into the stomach and small intestine. The CyberKnife System uses those fiducial markers as reference points to identify the exact location of the tumor during treatment. Once fiducials are implanted, the patient must wait approximately one week before CyberKnife treatment planning can begin to ensure that fiducial movement has stabilized. While wearing the vest and positioned in the cradle, the patient then will undergo a series of CT imaging studies, which will enable the CyberKnife team to determine the exact size, shape and location of the tumor. An MRI or PET-CT scan also may be necessary to fully visualize the tumor, liver and nearby anatomy. Once the imaging is done, the Synchrony vest and body cradle will be stored for use during CyberKnife treatment. Next a treatment plan will be specifically designed by a medical physicist in conjunction with the patient’s doctors. The patient does not need to be present at this time. During treatment planning, the imaging data is downloaded into the CyberKnife System’s software. The medical team determines the size of the area being targeted by radiation and the radiation dosage, as well as identifying critical structures where radiation should be minimized. Each patient’s unique treatment plan will take full advantage of the CyberKnife System’s extreme maneuverability, allowing for a safe and accurate liver cancer treatment. After a treatment plan is developed, the patient returns to the CyberKnife center for treatment. Doctors may choose to deliver the liver cancer treatment in one session, or stage it over several days. Liver cancer treatments are typically completed within one week. As treatment begins, the location of the liver tumor will be tracked and detected continually as the patient breathes normally. The medical team will be watching every step of the way as the CyberKnife System tracks the patient’s liver tumor as it moves, and safely and precisely delivers radiation to it. The CyberKnife System’s computer-controlled robot will move around the patient’s body to various locations from which it will deliver radiation. At each position, the robot will stop. Then, special software will determine precisely where the radiation should be delivered by correlating the location of the tumor using digital images of the fiducials and information from the Synchrony vest. The CyberKnife’s robotic arm will adjust the radiation source automatically, to follow the liver tumor as it moves. Nothing will be required of the patient during treatment, except to relax and lie as still as possible. Once treatment is complete, most patients quickly return to their daily routines with little interruption to their normal activities. If treatment is being delivered in stages, the patient will need to return for additional treatments over the next several days as determined by their doctors. After CyberKnife treatments, most patients experience minimal side effects, which typically go away within the first week or two after treatment. Doctors will discuss all possible side effects prior to treatment. In addition, doctors may prescribe medication to control any side effects, should they occur. After completing CyberKnife radiosurgery treatment, it is important for the patient to schedule and attend any follow-up appointments. The patient should be aware that his or her tumor will not suddenly disappear. 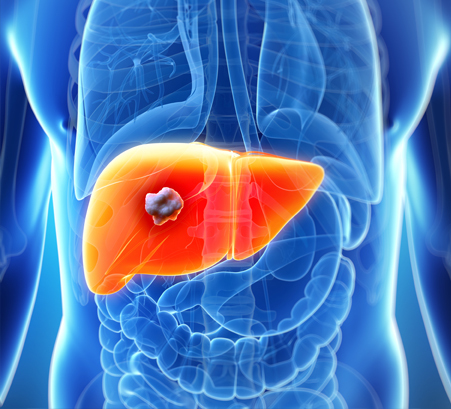 Response to liver cancer treatment varies from patient to patient. It could take several months or longer to determine the effectiveness of the CyberKnife treatment. Doctors will monitor the outcome in the months and years following a patient’s treatment through physical exams, blood tests and imaging techniques, such as CT or PET-CT scans. Liver cancer is the abnormal growth of cells in the liver resulting in a liver tumor. If the abnormal cells originated as liver cells, the resulting collection of cells is called a primary liver tumor. Some liver tumors are benign, meaning they are not cancerous and do not spread to other parts of the body. Malignant liver tumors, however, can invade other organs, and spread throughout the body. Most primary malignant liver cancers are classified as hepatocellular carcinoma or called hepatomas. A much more common cancer of the liver is a metastatic liver tumor. In this case, cancerous cells from another part of the body are carried to the liver by the blood or other bodily fluids. Metastatic liver tumors can spread to the liver from the colon, lung, breast, stomach and pancreas, as well as other sites in the body. More than 21,300 cases of primary liver cancer are expected to be diagnosed in the United States in 2008. Primary liver cancer is expected to result in approximately 18,410 deaths during that time.1 Five-year relative survival rates for metastatic cancer to the liver is 3.3 percent. In some cases an angiogram, which is an X-ray that shows the blood vessels in the liver, is used to identify the tumor as well. A liver tumor biopsy may be needed to confirm the diagnosis. Doctors then determine the stage – or extent of the disease – by establishing how big the tumor is and how much it has spread. For more information on CyberKnife’s ability to treat Liver Tumors, check out our Case Studies.